The Forestry Agency of the Japanese Government honored The Aodamo Preservation Society for its contribution to preservation of forestry resources and protection of environment. Since October 2000, The AODAMO PRESERBATION SOCIETY has planted approximately 22,000 AODAMO (Fraxinus lanuginose f. serrate.) seedlings in the forests of Hokkaido, on the northernmost island of Japan. The plan sees 2000 planted every year. By donating 3,000 yen (US$38), you can become a member of the society, and an AODAMO seedling will be planted on your behalf, with a board bearing your name placed alongside the seedling. After 60 to 70 years, the young tree will grow to a 16 to 20 cm in diameter to be suitable to make baseball bats. 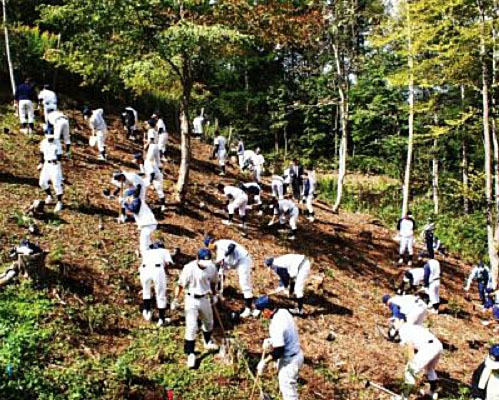 The planting of seedlings by young baseball players and volunteers serves as education, with an emphasis on promoting the conservation of forests and protection of water sources that are a vital part of the local ecosystems. In conjunction with the seedling scheme, the society also runs a program to utilize the broken bats of both amateur and professional players. The broken bats are collected and sent for recycling into furniture and, most notably, chopsticks by taking advantage of AODAMO's solid tree nature.